Were you arrested and charged with drug distribution or drug possession in Burlington County? If you were pulled over or subject to a search warrant at you home based on an investigation into drug crimes, you are likely facing an indictable felony charges at the Burlington County Superior Court. 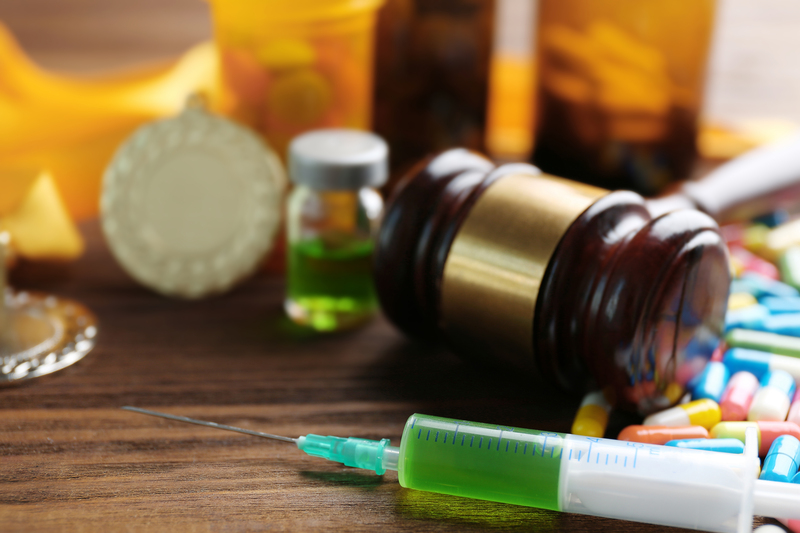 If you are facing third degree steroid possession charges or second degree anabolic steroid distribution charges, contact an experienced criminal lawyer. Depending on the weight of steroids or drugs involved, you could be facing up to twenty (20) years in a NJ State Prison. For more information on these types of charges, please read the information below. Proetta & Oliver is a Criminal Defense Firm in Burlington County that represents defendants charged with drug crimes, assault crimes, theft crimes and expungement matters. If you were arrested in Evesham, Cinnaminson, Mount Laurel, Mount Holly, Pemberton, Burlington Twp., Bordentown, Willingboro, Moorestown, Bass River, Maple Shade and Medford. For an immediate consultation with a criminal trial attorney, please contact our office today at (609) 850-8284. The Controlled Substances Act (CSA) is a Federal Law the classifies drugs under schedules based on their affects and addictive qualities. New Jersey’s laws then use these schedules to criminalize the possession and distribution of controlled dangerous substances within the State. With regard to Anabolic Steroids, they have been classified as a Schedule III narcotic. Steroids in New Jersey have been classified as a Schedule III controlled dangerous substance. Schedule III substances are those that (1) have a potential for abuse less than the drugs or other substances in schedules I and II; (2) have a currently accepted medical use in treatment in the United States; and (3) abuse of the drug or other substance may lead to moderate or low physical dependence or high psychological dependence. If you found in possession of anabolic steroids in New Jersey, you will be issued charges under N.J.S.A. 2C:35-10. This statute states that it is a third degree felony indictable offense to merely possess any steroids in New Jersey without a valid prescription. What are the Penalties for Possession of Anabolic Steroids in NJ? As a third degree crime, steroid possession carries the possibility of between three (3) and five (5) years in a New Jersey State Prison and a $35,000 fine. This could be in addition to probation, community service and a felony criminal record. Depending on your criminal history, you may be eligible for a diversionary program such as Pretrial Intervention, Drug Court or Conditional Discharge Program. For more information on these programs and whether we can get you admitted into a diversionary program in Burlington County, call (609) 850-8284. Can I Be Charges With Steroid Distribution if I Don’t Get Caught Selling? Yes. “distribution” charges under N.J.S.A. 2C:35-5, prohibits three types of conduct: (1) Distribution, (2) Manufacturing and (3) Possession with Intent to Distribute. The third types of conduct is the law the allows police and law enforcement to charge you with distribution charges even when you are not caught in the act of actually selling or distribution drugs. In order for the State to obtain a conviction for possession with intent to distribute, they must show that the defendant possessed or had under their control, a quantity of steroids and that it was the defendant’s intent to distribute them. Proof of intent cane inferred from the circumstances such as scales, small baggies and amount of steroids (beyond an amount for personal use). For more information on drug distribution charges, please contact our office at (609) 850-8284. Bring charged with steroid possession may not seem like a big deal at first glance. However, people are surprised to realize that steroid possession, regardless of the the amount involved, is a felony indictable offense in New Jersey. Considering that steroids are generally a means of supplementing your workouts, it is concerning for most defendants that a conviction will create a felony criminal record. This will haunt you in employment opportunities, undergraduate school applications, housing opportunities and more. If you or a loved one were arrested and charged with heroin possession, unlawful possession of a weapon, possession of cocaine, possession of prescription drugs or any other criminal offense, contact the Burlington County Attorneys at Proetta & Oliver. We are available to consult with you on your case 24/7 for your convenience. Do not hesitate to call today.